To advance the science, art and practice of ecological restoration. To educate our members and the public on sound scientific strategies and techniques of protecting, restoring and monitoring native habitat. To develop and promote ethical standards for practitioners in the field of ecological restoration. 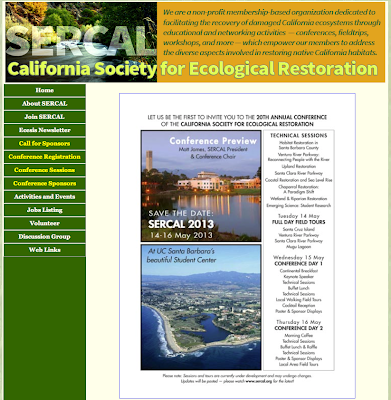 To facilitate communication among professionals and others with an interest in ecological restoration. To advise and consult with public agencies and appropriate entities regarding the improvement of standards and criteria for ecological restoration. Ventura River Parkway—Reconnecting People With the River. 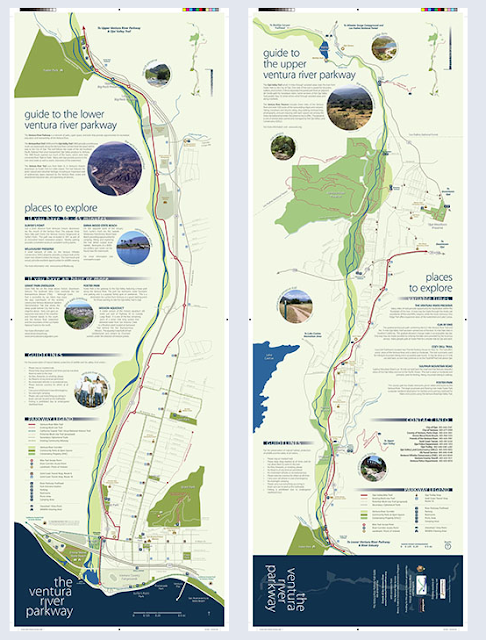 Managed Retreat: Restoring Habitat, Resiliency, and Recreation at Surfers’ Point. Louis A. White, PE*1, Bob Battalio, PE1, David M. Hubbard2, and Paul Jenkin3. 1ESA PWA, 550 Kearny Street, Suite 800, San Francisco CA 94108. The field tour included site visits to Surfers' Point, Ventura Hillsides Conservancy 'Willoughby property,' Ojai Valley Land Conservancy preserves, and Matilija Dam. The team based its analysis on a comprehensive water supply and demand model utilizing local data and the established WEAP software. 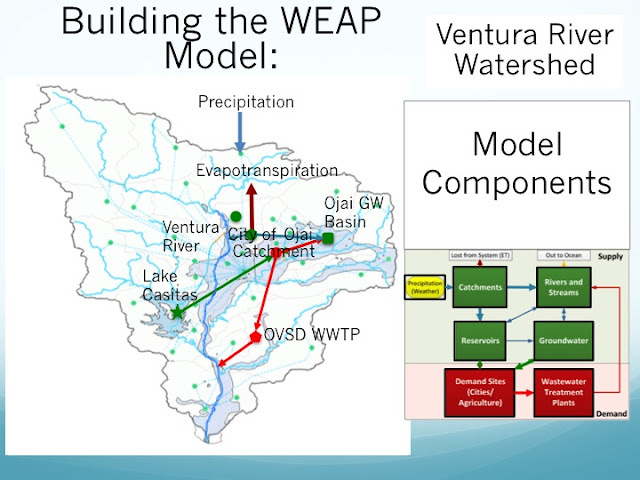 The model provides the opportunity to assess water management scenarios watershed-wide. Development of this model was no small task given the complexity of our system with its multiple jurisdictions, water districts, and water users. Two graduate students worked as interns over the summer to compile data and 'connect the dots' between supply and demand throughout the watershed. 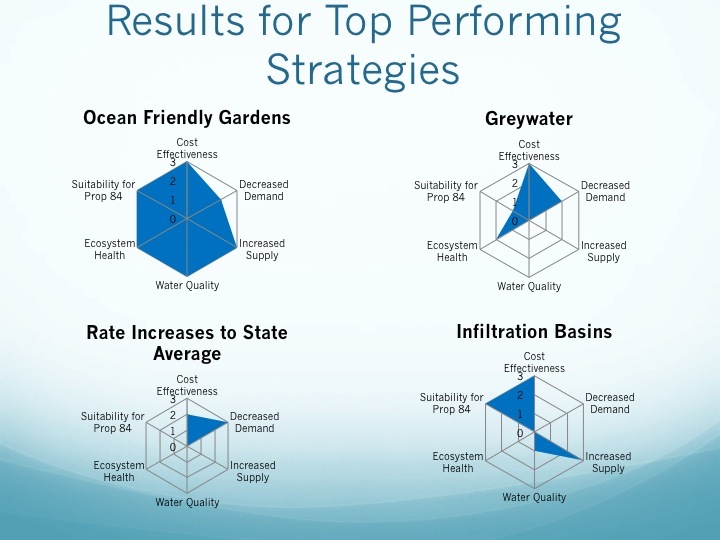 Water management strategies were evaluated based on six criteria: ability to decrease demand, ability to increase supply, cost-effectiveness, benefits to ecosystem health, benefits to water quality, and suitability for Proposition 84 funding. Results from the analysis suggest that, while climate and land use change have the potential to severely impact water availability within the watershed, implementing water resource management strategies can offset the impacts. Consumer-based strategies such as ocean friendly gardens and greywater systems in single family homes were shown to be very cost-effective options for reducing water demand and increasing water supply, benefiting riparian ecosystem health. Although they are less cost-effective than consumer-based strategies, infrastructure-based solutions such as decentralized infiltration basins were shown to be viable pathways towards increasing water supplies and improving water quality. Results further suggest that the most effective option for decreasing demand within the watershed is by increasing water rates, thereby incentivizing conservation. This is just one symptom of a complex water management issue that begins at the Ventura River - this year the river has dried up at Foster Park, one of the the city's primary water supplies. This water is piped to homes and businesses in the city, used once, and discarded as 'wastewater' which is treated and discharged into the Santa Clara River. We continue to advocate for 'Integrated Water Management' that would increase water use efficiency though conservation and decentralized re-use. 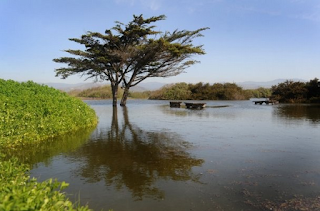 The Surfrider Foundation’s national ‘Know Your H2O’ campaign recognizes the importance of integrated water management as a solution to coastal problems. Many municipalities are responding to the global water crisis through the implementation of water recycling to diversify their water supplies. 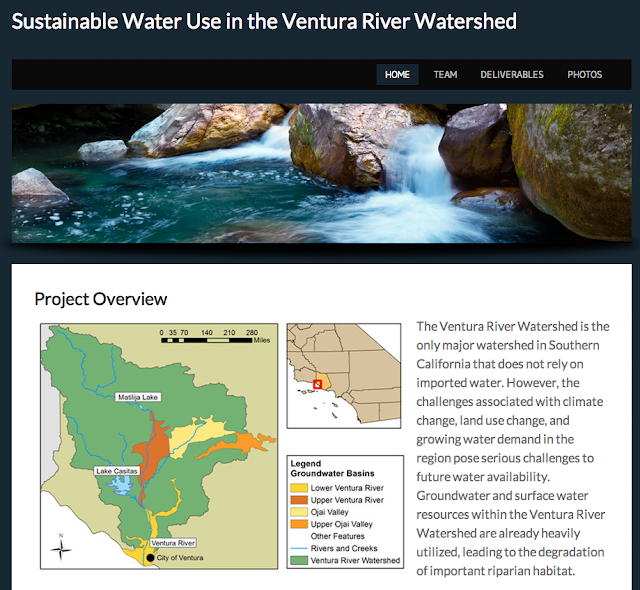 The SCRE Phase 2 study does an excellent job of identifying opportunities for wastewater reuse throughout the City of Ventura, and has identified a number of projects that may become components of an integrated water management strategy. As we have commented previously, it is important to recognize that, on average, two thirds of the water discharged into the Santa Clara River Estuary comes from the Ventura River. 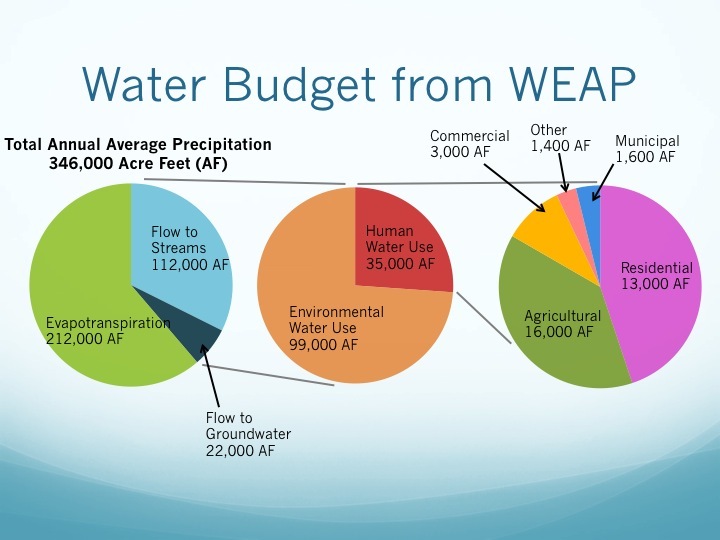 The report notes that the city’s water supply is stretched thin, and this is evidenced in the current drought that has dried up the Ventura River, including the City’s wellfield at Foster Park. Cumulative impacts within the Ventura River have resulted in a 303d impairment listing for pumping and diversion. Therefore, a watershed-based strategy designed to restore instream resources and protect groundwater basins is essential to addressing multiple regulatory pressures and to ensure the long-term viability of the city’s water supply. We agree with the general consensus from the stakeholder workshop that implementing Indirect Potable Reuse (IPR) and Direct Potable Reuse (DPR) within the City of Ventura is the highest and best use of the city’s wastewater. As discussed in the report, the Ventura River provides higher quality water than the groundwater on the East side. Therefore there is some merit to keeping Ventura River water within that watershed as proposed with the North side decentralized treatment plant. We also recommend that an East side decentralized wastewater treatment plant remain as a possible alternative in this strategy. This plant should be included in planning for urban expansion on the east side because treating and reusing water nearer its source would provide other long-term benefits. For instance, the location of the existing treatment plant within the floodplain of the Santa Clara River and an area of potential sea level rise inundation makes it vulnerable to catastrophic events that may require its relocation within the 50- to 100-year time frame. A citywide decentralized water reclamation system would reduce this vulnerability and limit the potential impacts from future flooding while increasing overall water use efficiency. ...To summarize, we strongly support an expanded water-recycling program within the City of Ventura, but disagree with the analysis of habitat enhancement from the wastewater discharge into the Santa Clara Estuary. We encourage the City to continue to develop an integrated water management plan that considers the broader long-term benefits of increased water use efficiency.